The MacBook chargers are possibly the best notebook power adapters in the world: They’re small, and you can wind the cord around two retractable hooks. Now Twelve South has come up with a little gadget called the PlugBug that can ride piggyback on your MacBook charger to let you plug in any iPhone, iPad, or USB device. 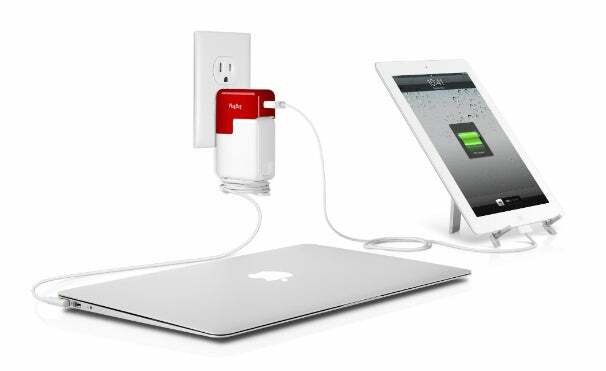 The PlugBug Is a 10-watt USB wall charger that you can either plug directly into the wall or attached to your MacBook power adapter, so it can charge your Mac and a separate device at the same time. Having an adapter that can charge two Apple devices could be extremely useful to MacBook Air or MacBook Pro users who only have two USB ports, or to those who just want to free up an outlet. The PlugBug is small and shaped to conform to the dimensions of a MacBook charger for a single travel-friendly power brick. Once the two are attached you won’t have to carry a separate charger for your notebook and iDevice. Also, if you happen to be visiting the US and Canada from out of country, the PlugBug can be attached to international power adapters to make them compatible with North American power sockets. The PlugBug is available now for $34.99 and can be bought directly from Twelve South.